We purchased towels when we were there many years ago and would like to replace them. 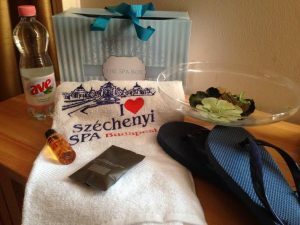 Do you sell and ship Szechenyi Bath towels? We live in the United States. I purchased tickets through this website, and they were supposed to be emailed to me. I have paypal receipts but no email yet. When can I expect that? There was also no confirmation page with a confirmation number or anything after paying. thank you, in the meantime you have confirmed the receipt of your confirmation emails. Hi, if I buy a towel, will it be the same as shown in the picture? 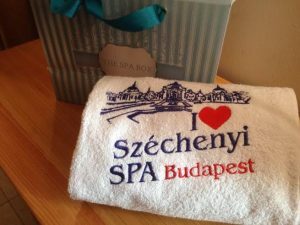 yes, the towels that you can buy are the ones with the Szechenyi logo. Hi there, we are total of 3 people. Can I buy 2 entrance with locker and 1 with cabin? and the 3 of us will share the usage of the cabin? Does the spa provide towel, shampoo & soap use? yes, it is possible, but in this case you will need to make 2 separate bookings. I couldn’t understand what is the cost for towel rental and also if flip flops are provided as well?? I am not interested in buying them just renting them. Can you tell me the cost for then? Simple Bath Sheet: HUF 1,000 (deposit: HUF 1,000). HUF means Hungarian Forint, which is the currency of Hungary. Can I book a package for 2 for an open date? It d be ideal sincs its a present. Is locker chargable otherwise/whT other charges could be ? the swimming cap is obligatory only in the swimming pool, you can enter all the other thermal pools without it. You can buy tickets with cabins or with lockers. Please use the comment field to request an open date gift voucher.